About a month or so after Kristin vanished, the Flores' rented out 529 East Branch Street to Mary and Joe Lassiter. David Smallwood, publisher of The California Register, interviewed the Lassiter's and you can hear that interview below. The interview is over 50 minutes long - the key parts are the 13:00 minute, 18:00 minute and the 23;50 mark. Mary talks about her experience dealing with the Flores while living on the very property where the FBI thinks Kristin may have been hidden. They just happened to rent a home not knowing what they were getting themselves into. They only learned of Kristin's case after receiving hate mail from the public. The Flores' never mentioned Kristin Smart to them when they applied to rent the home. 13:00: Mary Lassiter talks about tiny specs of blood on the shower curtain and walls of the shower. 18:00: Mary Lassiter speak about hearing a 'beeping watch' sound every morning at 4:20am that she believes was a watch that was buried right outside her bedroom window. Eventually, the beeping stopped leading her to believe the watch battery died. ​Turning it over to TWO Detectives. One held it up while the other took a photograph. The earring was subsequently lost by the SLO Sheriff's Department. With ‘Search Warrant’ in hand, the San Luis Obispo Sheriff’s Department rolled up on 529 East Branch Street and basically took over the property for the entire day. They were there to look for (a) Kristin’s remains and/or (b) any evidence related to her disappearance. As the afternoon began to wind down, the Sheriff’s Department ended their search, packed up all the gear and headed home. THEY NEVER DUG UP THE YARD. Here is the 'Search Warrant'. A few months after this took place, I met with Undersheriff Steve Bolts in his office at the Sheriff’s Department. I asked him ‘why they did not dig up the property’? HIs response to me was: “We took a vote that day whether or not to dig up the yard, Dennis’, he said, “I voted ‘in favor’ of it, but I was outvoted”. Note: In fairness, Undersheriff Steve Bolts disputes this account. 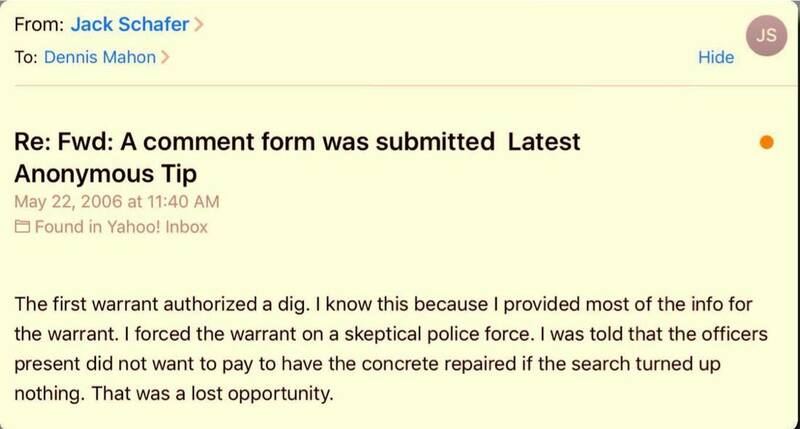 In an interview with Stacy Finn of the San Francisco Chronicle, Bolts told the reporter the the first warrant did not authorize 'a dig' and that the 'vote' taken that day was to whether or not to apply for a '2nd warrant' that would 'allow' a dig. [See FBI Agent Jack Schafer's email below]. Shortly after this meeting I was on the phone with an FBI Agent very familiar with the case and I mentioned to him UnderSheriff Steve Bolt’s comment. The Agent became very angry over this statement and to be honest, his displeasure literally caught me off guard because I did not understand the significance of it. ​​Another FBI Agent in this chronology is a very important person in this case. His name is Jack Schafer. Agent Schafer is the man who personally did most of the work and provided most of the info for the search warrant. All the evidence you read in the warrant was compiled by FBI Agent Jack Schafer. He went to the property, interviewed the Flores as well as the neighbors and just did a terrific job for the Smart family. Agent Schafer submitted his warrant to the Sheriff’s Department. They, in turn, submitted the paperwork to the judge and the judge signed the order to go ahead and search Susan Flores’ property. Years later - I emailed Agent Schafer and mentioned to him about my meeting with SLO Undersheriff Steve Bolts. I simply cannot offer a better’ source’ then the man who the FBI chose to do the primary investigative work and the person who provided most of the info for the warrant. 320 million people in America and no one is more qualified to make such a statement than FBI Agent Jack Schafer. I do not have permission to use his name so I will just speak very generally. He obviously knows all about the work Jack Schafer has done and how the SLO Sheriff’s department came up short on June 20th, 2000. He decided to do something on his own time acting as a private citizen. He contacted Susan Flores and somehow got her to agree to allow him on her property without a search warrant. IMPORTANT: He was doing this as a private citizen, not as a Law Enforcement Officer’. There was one condition: Susan Flores only gave this FBI Agent permission to search one part of the yard. He did not have permission to search the entire yard. Keep this in mind: An FBI Agent from out of town, on his own time, spending his own money (travel, etc), had to round up a few of his buddies, take time off of work and drive hours to Arroyo Grande to search just a portion of Susan Flores backyard because the Sheriff’s Department, for whatever reason, simply did not want to do it. This search took place on May 22, 2007 and nothing was found. I spoke with the FBI Agent the following day and I was honestly kind of depressed because I thought that the lead was ‘no good’. January 3rd, 2011, Ian Parkinson was sworn in as the new Sheriff. 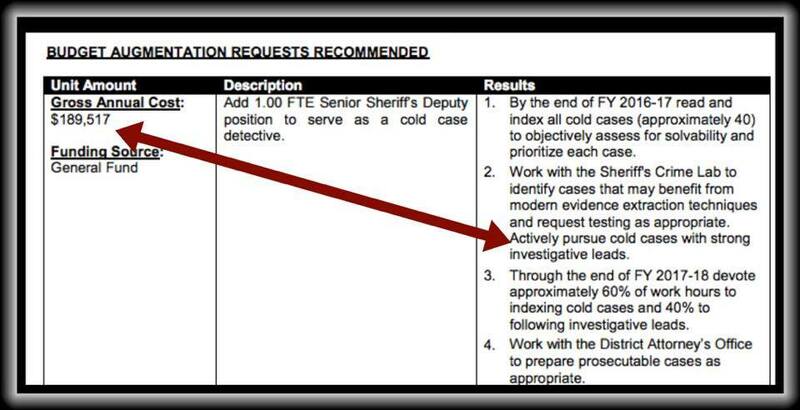 In his first term, Sheriff Parkinson requested from the Board of Supervisors additional funds to hire an extra detective to help with the backlog of cold cases. His request was ignored. County Administrator Daniel Buckshi decided it was not important enough and would not allow the Board of Supervisors to vote on approving the funds. Learning that, friends of Kristin Smart began making phone calls, showing up at town hall meetings and lobbying to correct this situation and just this last fiscal year, the Sheriff was granted the extra funds to hire the detective he said he needed. Cost to the SLO Taxpayer for one detective for one year came in at $189,517.00 which is about $15,800.00 per month. Despite this, SLO still has not been back to the property. Last year, I spoke with Sheriff Parkinson over the phone and the call lasted about 30 minutes. I asked the Sheriff that now that he was the boss and he could see for himself all the files regarding Kristin’s case if he could come up with a good reason why the backyard has not been dug up. He responded by saying he knew that mistakes had been made in the past and that it was very important to him that he makes things ‘right’ by the Smarts’ as far as doing what he could to correct past mistakes. He really came off very, very sincere. He then went on to explain about the way ‘warrants’ work. The warrant does not specifically say ‘go dig up a body’. It is more in the spirit of ‘you are to search anywhere and everywhere where it is reasonable to expect a body could be hidden’. He then added: “Did the Officers conducting the search 16 years earlier do that? “I don’t know, Dennis”, he said, “I wasn’t there, so I don’t have those answers”. In June of 2015, Retired Detective Paul Dostie from Northern California, travelled down to Arroyo Grande with his Cadaver Dog, Buster, in tow and searched the perimeter of the Flores property. Buster alerted to the presence of human decomposition 4 separate times on the Flores property. Detective Paul Dostie has begged SLO to simply take a soil sample from the Flores property and allow the scientists back at the lab determine if there is human decomposition of a caucasian female on that property. The SLO Sheriff’s Department has thus far not taken him up on his offer. As amazing as Buster is, the new technology available today will simply astound you. The equipment is still in the 'Patent Process' stage but it's abilities far supersede Cadaver Dog and GPR capabilities. Only because of the 'Patent Processing Stage' have I been asked to speak only in general terms about this new technology. What would you think if you were to learn that this has already been done and positive readings have already been detected on the Flores property? It is true. Again, Sheriff Parkinson knows all this and still, for some reason, he is not sending his men and women over to 529 East Branch Street. “We always want to do all the science possible before digging. All we (including Smart family attorney) have asked the Sheriff to do is to conduct a Ground Penetrating Radar survey of the suspected site by scanning through the retaining wall from the neighbor’s yard. If what the ‘eye-witness’ described is accurate, we should see an anomaly in the GPR data. Dr. Kent Schneider has volunteered to conduct the GPR survey at no cost with just his expenses paid (Air fare, lodging meals). Note from Dennis: In the early 2000’s, the FBI Agent told me that concrete was poured in the Flores yard the same weekend Kristin vanished. I have listed reasons why I believe the Sheriff’s Department needs to get back on Susan Flores’ property, dig it up, and once and for all determine if Kristin is there now, or if she was moved. There is a lot here and I promise you I am not making anything up, nor am I exaggerating anything. For me it all boils down to the May 22nd, 2006 email I received from FBI Agent Jack Schafer where he himself tells me that the first warrant authorized a dig. It seems to me that Kristin’s ‘civil rights’ were violated that day by the Sheriff’s Department and that needs to be corrected.